The negative stain is particularly useful for determining cell size and arrangement. It can also be used to stain cells that are too delicate to be heat-fixed. We use nigrosin as our negative stain. Nigrosin is an acidic stain. This means that the stain readily gives up a hydrogen ion and becomes negatively charged. Since the surface of most bacterial cells is negatively charged, the cell surface repels the stain. The glass of the slide will stain, but the bacterial cells will not. 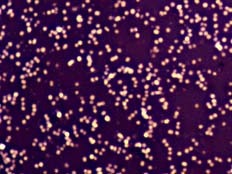 The bacteria will show up as clear spots against a dark background.